Lemon Drop: Coffee & Walnuts ...oh my ! 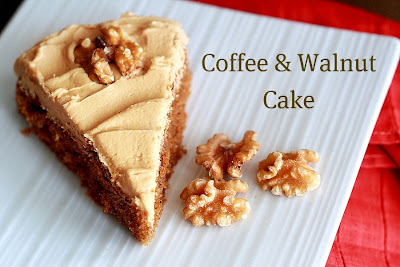 My first taste of the renowned British favorite Coffee and Walnut Cake took place today. My life will never be the same again. Smooth, rich, creamy and wonderfully flavored with espresso. There is NOTHING better especially if you are in any way like me: a true coffee addict. I am hooked ! I researched a few different recipes that seem popular but in the end tested out Nigella Lawson's Coffee and Walnut Layer Cake recipe. Ok granted, the one I made is not a double layer cake. For this recipe I simply halved the ingredients to create an amazing single layer cake. The fact is there are only two people in my family who like the flavor of coffee and I am one of them. A single layer cake for this household would be overkill but a single cake on the other hand is just right. I was somewhat hesitant to start off because it requires grinding of walnuts in a food processor. That means messing around with sharp blades. I tend to be a tad accident prone and having already had a slice and dice related accident earlier this week I was somewhat "gun-shy". But I stayed alert, ground the nuts and came out of it with all digits intact. When I read through Nigella's recipe I was also very surprised to see that the cake only takes 25 minutes to bake. It contains 1/2 cup of butter and 2 eggs making it quite a dense batter. I thought it would take far longer to bake and was hoping Nigella's online recipe wasn't riddled with typos. My fear was baseless. The recipe is error-free. The cake baked up perfectly in 25 minutes and is one of the moistest cakes I have ever eaten. Topped off with a buttery swirl of coffee frosting and one has nirvana on a plate. Ohhh, what a lovely cake. Thanks for sharing it with Sweet Tooth Friday! This looks delicious. I wish I had a piece right now! Oh My is right. Cake looks awesome! This turned out really well! The only suggestion I have is to probably halve the amount of icing sugar for the icing as I found it too sweet. Otherwise, this recipe is definitely a keeper! :) Thanks.